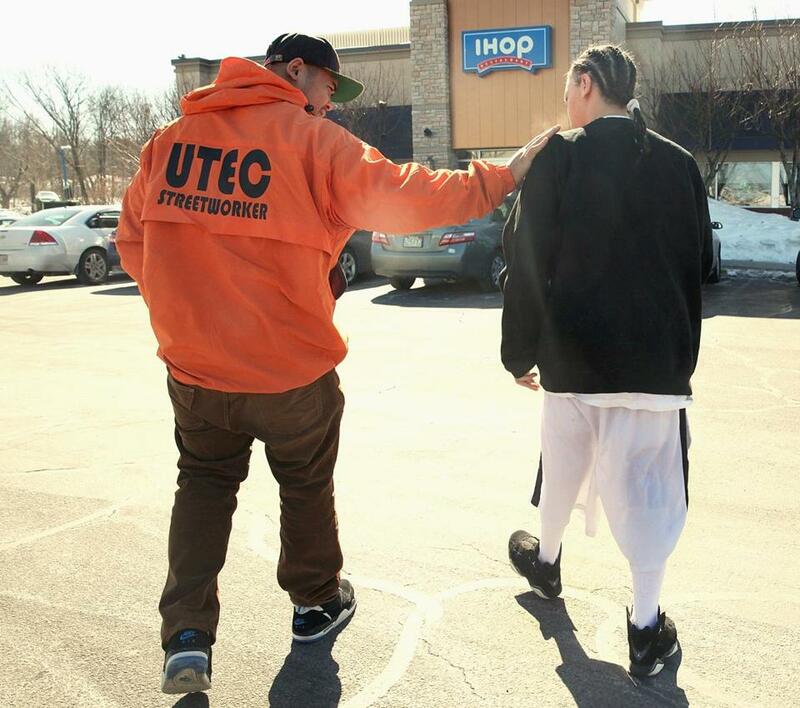 A UTEC street worker makes IHOP a first stop for a young man released from the Middlesex House of Correction in North Billerica. In a handful of courthouses in the Merrimack Valley, an important experiment in criminal justice reform is underway. Court officials are partnering with UTEC, a Lowell organization that works with some of the toughest young men in the region, to reimagine probation — that critical way station between freedom and imprisonment. Some 56,000 people statewide are under probationary supervision — either in lieu of a prison sentence, or as they ease their way back into society after months or years behind bars. And the Merrimack Valley pilot program homes in on one crucial subset of that population: young adults, ages 18 to 24. Decades of neuroscience research show that the brain is still developing into the mid-20s. That can mean a lot of bad, impulsive decisions; this age cohort has a higher recidivism rate than any other. But when the brain is that plastic, there is also real opportunity for redemption. For turning lives around. Indeed, the pilot joins a small, but promising array of programs around the country that aim to carve out a unique place for young adults in the criminal justice system. Prisons in Billerica and Cheshire, Conn., have established separate young adult units. And San Francisco launched a Young Adult Court a few years ago. In the Merrimack Valley, about 30 high-risk young adults are participating in the voluntary program so far, with plans to expand to 60 or 70 if the state does the right thing and steps up funding. Participants work in a handful of UTEC-run social enterprises — a mattress recycling business, a cafe and catering outfit, and a woodworking operation that makes cutting boards and salad tongs sold at Whole Foods markets throughout the Northeast. UTEC — founded 20 years ago as United Teen Equality Center, but now with an expanded mission to serve older youth, ages 17-25 — also offers free child care and mental health services. And the organization says its young adults have substantially lower recidivism rates than the broader, justice-system-involved population in this age cohort. The group has had an informal relationship with the probation department for years. But UTEC will now be able to access probation’s formal risk assessments, offering a more robust picture of the young adults it serves. And eventually, probation will dedicate officers in five courthouses to work directly with UTEC — referring young adults to the program and monitoring their progress. The courts and probation department are also discussing incentives for completing UTEC programming — including a reduction in probation fees and trims to probation sentences. Importantly, all the players seem willing to experiment. Gregg Croteau, chief executive of UTEC, says the program will function as a “learning lab,” with lessons to be drawn by the state and, hopefully, the nation. Only time will tell, of course. But for now, the Merrimack Valley experiment is certainly worth supporting.